With a 45-0 record, Granite Bay stated a case as one the state’s most dominant teams ever. After 4 straight BVAL titles, Heritage has never been more primed for its first NCS crown. A blend of camaraderie, talent and experience could be perfect mix for Christian Brothers. SportStars’ pre-tournament look at the top four NCS Divisions. Shaped through triumph and tragedy, Maddie Dilfer is the positive force driving state-ranked Valley Christian. Brianna Karsseboom leads a talented Bishop O’Dowd roster aiming for new heights. Campolindo girls volleyball wrapped up a 12th NCS title behind a care-free attitude and serious talent. 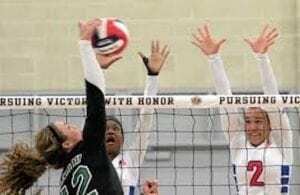 Oakmont girls volleyball is immersed in a charmed season that may vault the program to new heights.